Cost to excavate land for a new house – labor, materials expenses. How much does it cost to excavate the land for a new house? Cost to excavate the land for a new house will be determined by several factors. Total expenses for digging the ground and leveling the surface will primary depend on how many cubic yards of soil have to be removed, slope and soil type. Excavation work will be estimated after lot inspection and analyzing the plan for house foundation approved for building a new house. A contractor will quote the work accounting its complexity. On the city lots with electric and septic systems in place very often a contractor hired for completing concrete work will do the excavation part as well if there are no old house remains or large debris on the property. Preparation of building site from the scratch is much more complex process. Removing trees, roots, larger rocks and digging tranches for drainage system is time consuming process and special equipment should be used for performing such tasks. The cost will mainly depend on equipment which will be involved for completing the project. Excavating rocky terrain with compact excavator might not be only ineffective but impossible. Operating powerful machinery with 40,000 lb. or higher arm digging force will result in significant price increase per each hour of work. 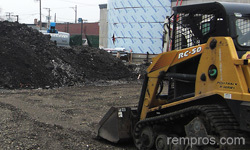 Excavating contractor normally does not divide overall expenditures into any sub-categories. Estimate for excavation the land will include total expenses for operating specific machine during certain period of time. There are might be not a single excavator(s) operator(s) involved in the project and a contractor will always adjust overall expenses after determining scope of a work. There are no two projects equally the same. Using adequate machinery, an excavation company will typically complete digging for pouring concrete foundation while building 2,700 – 2,900 ft2 two story house with 8’ high basement in one day. High slope, limited accessibility to the lot, trees on the site, presence of rocks in the soil or old structure remains, underground piping work are the factors which might slow down the process. But In any case, even complex work shouldn’t last longer than few days. After foundation done and concrete cure, an excavating contractor will place backfill soil in tranches and holes as well as make the surface flat. If you hire a general contractor to build a new house there are very little to worry about. After purchasing land and finalizing all technical and financial details the general contractor will be in charge of all on site work. Property owners who are planning to cut construction costs and organize or even complete some work by self should be prepared very well in order not to get into any trouble. Before start excavation work always consult with a local building inspector and make sure there won’t be any sewer, water pipes or underground power lines close to the excavation site because damaging one might cost you more than savings from elimination of middle man’s profit.